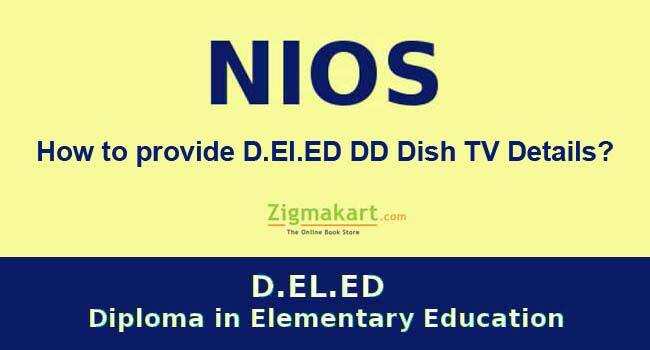 1 How to provide DD Dish TV Details on NIOS D.El.ED Website? 1.1 Who has to share DD Dish TV details on NIOS DELED Website? 1.2 Is It mandatory to provide DD Dish TV details on NIOS website? 1.3 How to share your DD DISH TV Details with NIOS ? 1.4 How to get DD DISH TV Serial no? According to the new update from NIOS, all the D.EL.ED pursuing teachers are required to share their DD Dish TV details, which they have been procuring under a rebate scheme for D.EL.ED. The D.EL.ED course fee for the first year is Rs. 6000 and a rebate of Rs. 1500/- for online study via TV lecture was also offered by NIOS. These lectures can be seen on channel no 32 (SWAYAMPRABHA Channel). Now NIOS has asked students to provide their DD Dish TV details. Who has to share DD Dish TV details on NIOS DELED Website? All the study material of NIOS DELED course is available online only. The learners can do their studies through MOOC Platform, SWAYAMPRABHA VAGADA DTH Channel no 32, DD DISH TV Channel no 32, NIOS D.EL.ED APP and MUKTAVIDYA VANI. Almost all Un-trained teachers are studying through SWAYAM Website and NIOS D.EL.ED PDF files and some are using D.EL.ED App also. However, there are few learners who have purchased DD Dish TV through D.El.ED scheme. They watch SWAYAMPRABH Channel to do their studies. NIOS has asked them to share the Dish Tv procurement details on its official website. Is It mandatory to provide DD Dish TV details on NIOS website? Yes, It is mandatory for all the learners who have procured DD Dish TV for watching SWAYAMPRABHA Channel. However, It is not mandatory for those learners who have not procured DD Dish TV. They need to select “NO” option. How to share your DD DISH TV Details with NIOS ? Please visit NIOS D.EL.ED Website and on the home screen you can get the link. It can also be found under Teacher Section. After that you will get a form where you need to enter the details. Once you click on submit option, these details will be shared with NIOS. How to get DD DISH TV Serial no? Every Set Top Box is distinguished by, a unique serial number. If you have purchased a DD Dish TV then, its serial number is printed on the back side along with QR code. These details can also be obtained either by scanning the QR code or, by accessing the device manual. Let us know your view about “DD DISH TV NIOS Details” along with any other concern. Please share this information with your fellow teachers who are pursuing this programme.